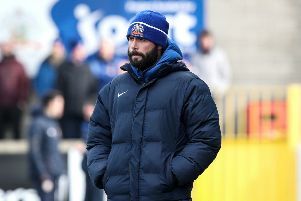 Josh Carson believes the sweltering conditions of the last fortnight will stand Coleraine in good stead for the forthcoming Europa League tie. While the rest have the province have been sunbathing or indulging in barbecues as the sun bakes down, Carson and his team-mates have been slogging it out on the training field in preparation for their trip to Serbia next week. On Saturday they took on Glenavon in their opening friendly as temperatures topped 25 degrees at The Showgrounds. It was a credit to both sides as the produced a high intensity encounter in the heat. “We’ve done our homework on them, we’ve been on the internet to see what we can find out about them,” he said. “They’ve had a lot of top players who have come through their ranks in the past. “It’s going to be a tough test for us, we’re not going to go in to totally oblivious to the challenge that awaits us. “It’s going to be similar weather to what we have had of late. “That will stand us in good stead playing in 23 degree heat. Glenavon made the early running at The Showgrounds and almost edged in front with only four minutes on the clock. New boy Niall Grace found space in the box to direct Andy Hall’s corner goalwards, Ciaron Harkin did well to hook the header off the line, but the ball fell for fellow debutant Dylan King, who fired over. A great surging run down the right by Mark Sykes on 28 minutes created the next opportunity for the visitors. His deep cross found Josh Daniels at the back post, who produced a neat bit of skill before looping a header over the bar. Coleraine finally carved out an opening on 34 minutes as Carson fed a clever ball through to Jamie McGonigle, but the striker’s shot from a tight angle flew across the face of goal. Two minutes later McGonigle created a little bit fo space in the box, he hit the target this time, but Tuffey easily gathered. Just before the break Carson cut in from the right-hand side and forced Tuffey into a smart save at his near post. Coleraine should have broken the deadlock at the start of the second half as that man McGonigle found himself presented with two glorious chances. First on 47 minutes Ian Parkhill found him in space in the box, but the striker miscontrolled and the ball squirmed away from him. Then four minutes later Parkhill’s tenacity in the tackle sent McGonigle racing clear on goal. But he was denied by a great save from substitute keeper James Taylor. On 55 minutes Glenavon Andrew Mitchell bore down on goal at the other end, but he too was denied by a great save from Michael Doherty. The game understandably lost a bit of its competitive edge in the last 20 minutes as the heat finally took its toll. Glenavon brought on Gary Hamitlon and Kris Lindsay for the closing stages and it proved to be the right decision as they snatched the late win. Stephen Donnelly showed good movement and composure to coolly slot home in stoppage time. Coleraine: Doherty, Mullan, Harkin, Lowry, Bradley, Carson, McConaghie, Burns, O’Donnell, Traynor, McGonigle. Subs: Douglas, Lyons, Crown, Parkhill. Glenavon: Tuffey, Marshall, King, Doyle, Muir, Daniels, Grace, Sykes, Hall, Mitchell, Murray. Subs: Harmon, Donnelly, Hamilton, Lindsay, Singleton, O’Mahony, Norton, Taylor.